By national route 237 with direction to the east we arrive to the Limay River, where the typical landscape of the patagónic steppe is observed. At this point there is the detour that takes National Route 231 to Villa La Angostura, a route that involves skirting the Huemul Arm of Lake Nahuel Huapi, where the traveler will be surrounded by cypress forests, which will gradually give way to the forest damp. 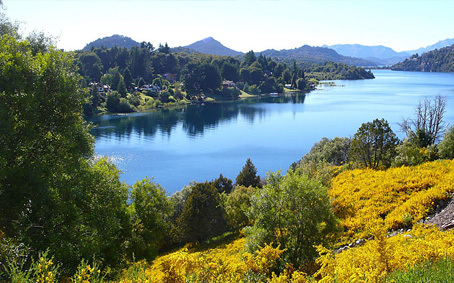 The Villa is located on the north coast of Lake Nahuel Huapi and has different attractions: The ports in Bahía Mansa and Bahía Brava, the historic presidential residence El Messidor, and the La Asunción Chapel. Return to San Carlos de Bariloche. Only in Winter Season (June to August): you will enter Cerro Bayo, where you will have the possibility of taking a lift to get to know the slopes of skiers and paradores on the mountain. At this point we can choose between spending all day at the Ski Center (where we can do some activity such as skiing or snowboarding) or go down to lunch in the city of Villa la Angostura.